As in Lacanian psychoanalysis (and critics have pointed out links between Lacan and Beckett) the self is fashioned by joining what Lacan calls The Symbolic Order: the social community of laws and rules, importantly those of language. But by going through this inevitable stage it is cast out from a pre-Oedipal, pre-linguistic ideal of wholeness. This state of wordless nature Lacan terms the Real and it is related to Heidegger's and Sartre's concept of Being-in-itself. The self that has become part of the Symbolic Order can never attain this primordial fullness of being, this unselfconscious completeness such as an a baby or an animal might have, but is thereafter a product of language; a being conscious of itself and of how it is seen by others. After the fall into the social system of the Symbolic, the self is made up of pre-existing rules, gestures and words and in its consciousness of this is aware of inauthenticity. Not only are words separate from their referents (Magritte writes 'the doo' under his picture of a horse), they are separate from their speakers. The self cannot find words to express its emotions, as in lines by WH Auden 'Because I love you more than I can say, If I could tell you I would let you know.' or Carol Ann Duffy 'No prayers written to bless you,/I write them white', or many a Valentine card. But there is more to it than that. In every act of using words, not just in the most intense 'raids on the inarticulate', the self becomes witness to its own productions. It becomes a split subject, as the French linguist Émile Benveniste says, divided between the 'I-who-speaks' and the 'I-who-is-spoken'. And although this split can be applied to both the writing and speaking self, it seems more acute in speaking. Some philosophers (Rousseau, Levi-Strauss) have praised speech over writing as a purer, more direct way of communicating. Writing is thought of as a mere supplement to speech. But this has been countered (notably by Derrida) and in fact Rousseau contradicts himself here, writing in his Confessions that he wants to hide from society because in society he would show himself 'not just at a disadvantage but as completely different from what I am. If I were present people would never have known what I was worth'. This is pure Benveniste whose 'I-who- speaks' is always to some extent underrepresented by the 'I-who-is-spoken'. Strategies for trying to overcome linguistic frustrations include silence, non-linguistic sounds and the French feminists' attempt to write from the body in their écriture féminine (the term coined in 1974 by Hélène Cixous) which tried to subvert Lacan's Law of the Father: 'to smash everything, to shatter the framework of institutions, to blow up the law, to break up the "truth" with laughter.' This intoxicated, transgressive, pre-Oedipal logorrhoea claims to be female essence ('We’re stormy, and that which is ours breaks loose from us without fearing any debilitation. Our glances, our smiles, are spent; laughs exude from all our mouths; our blood flows and we extend ourselves without ever reaching an end') but these volcanic outpourings are still made of words, still socially determined. And the feminine too can be seen as socially constructed. I should like to suggest another approach, which goes in the opposite direction from both silence and the body babble of the feminist theorists. It's one that belongs to the salon not the bedroom/nursery and this is because, rather than chasing essential being, it chooses artifice. It operates through ironic detachment from words that obviously don't mean what they say. Irony had its origin in Classical Greek comedy with battles between the witty eiron and the boastful alazon but intriguingly it becomes a popular trope in the Renaissance when humanism and humanist rhetoric stress the potentialities of the individual self. The God-like individual with his soaring potential is thought to rise above the God-fearing wretch of the Middle Ages. Yet such heroic self-assertion isn't the only game in town. In Shakespearean drama, for example, two kinds of self-presentation are contrasted, sometimes tragically. Playful characters who engage in witty, theatrical distancing from sincere speech run rings around the individualistic heroes who claim to speak their own truth. The battle between eiron and alazon is revisited. Of course these playful tricksters may be devious and malicious but they are more often open liars and undisguised role-players like Falstaff or the professional Fools. They choose the negative way of 'Not I', projecting an obvious facade rather than claiming to say what they feel. 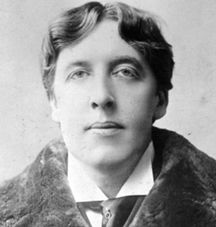 Their heirs are JK Huysmans, Andy Warhol, Noël Coward and all the dandies, wits, aesthetes and purveyors of camp expressed in Oscar Wilde's epigram that 'the first duty in life is to be as artificial as possible'. 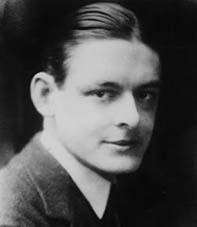 And this witty, debonair approach is not a million miles from the social formality of Eliot which preserves a hinterland behind his formal manners. Eliot was mocked by bohemian Bloomsbury for his conventional behaviour but maybe his approach was the more discerning. Artificiality and conventionality are paradoxically genuine by owning up to the split between speaker and words. And because the words spoken in games, wit, performances, formalities are manifestly artificial, they leave a silent, uncontaminated space for unexpressed potential. In negating his/her own speech the wit or ironist comes close to that silence desired by Prufrock. The performative dandy and the scuttling crab are, it seems, oddly related. This construction of a facade has parallels in visual art. 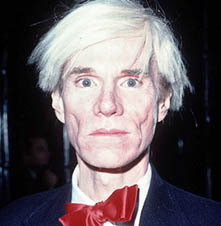 Moving briefly from speech to images, the paradox of the deeply superficial is comparable to Warhol's pursuit of sham. Warhol constructs himself as a brand, a contrivance (silver wig, white make up, vacant stare and dumb answers) while his self- portraits and Hollywood icons emphasise surface. The masks of the glamorous are made more mask-like, blatantly two-dimensional, by emphasising process, the process of their formation in silkscreen. In the Marilyn Diptych, repetition, blurs, gaps, mismatched shapes, unnatural colours all draw attention to the surface, production and artificiality of the work. Yet these gaudy veneers do not amount to triviality. The overt artifice of his self-fashioning and portraiture leaves an empty space, an inscrutable absence, which shimmers with potential and is a visual counterpart to the playful linguistic facades that make room for infinite possibility. And this can be related to the sacred icons in the orthodox church with which Warhol the Byzantine Catholic, would have been familiar and by which he might have been influenced. These devotional images, made to inspire contact with a saint or Jesus or the Virgin Mary, can also be seen as mere marks on a surface, panels hanging against a wall, in a way like Warhol's secular icons of Liz and Mao and Marilyn. But seeing them in this banal way does not necessarily undermine or sneer at faith. It might even increase a sense of the mysterious and enigmatic. As in negative theology, the deity is beyond all representations, it can only be alluded to by what it is not. Focusing on holy icons as mere artefacts, as human productions made of wood and paint, opens up a void in which the divine is not misrepresented because it is not represented at all. Once again the stress on artifice, veneer, fiction, point to what is not and cannot be expressed.